The head teacher of a girls' school which has banned the use of Fitbits has denied it did so because pupils are counting calories and missing meals. Stroud High School has prohibited devices capable of accessing social media amid concerns about the impact it can have on young people. 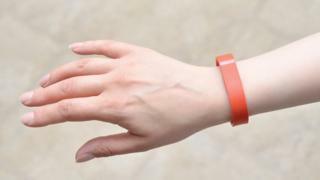 The ban includes the wearable activity monitors because they can access it. The school said research shows social media can lead to a "decline in wellbeing" of teenagers. In a letter sent to parents last week, the school said "tight controls" of the use of mobile phones "and smart technology including smart watches and Fitbits" would be introduced in September. Head teacher Mark McShane said some pupils had discussed with staff how they count calories and amend their lunch accordingly, but Fitbits had not been banned specifically because of this. His letter stated: "If not addressed, we open the door for social media to cause significant problems for young peoples mental health and wellbeing. "Being a teenager is hard enough, but the pressures faced by young people online are unique to this digital generation." Mr McShane added: "We have spent a lot of time this year looking at the impact of mobile technology on the welfare of young people. "We certainly believe technology has an important role to play in our school community but we must be confident that it is making our lives better. "Too many pieces of research and studies are now demonstrating a link between the decline in well being of teenagers as a result of mobile phone use and social media. "We want our older students to feel in control of their digital lives, and for this reason we want to limit their use in school." The ban will apply to years 7-9 during the whole day. Years 10-11 will be allowed to use their phones at lunchtime, and sixth form students will be allowed to use them "as they wish, but not in lessons".